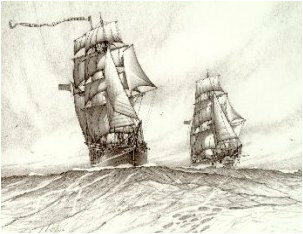 The Brigantines "Eye of the Wind" & "Golden Plover"
Both Rich and I have many wonderful memories of our journeys on the "Eye" and some of the experiences we had. Rich's first trip on the "Eye" when it first came to Australia was between Hobart Tasmania and Port Melbourne in 1985. He just couldn't wait for the next trip which was the Australian Bi-Centenary celebrations and the re-enactment of the First Fleet in 1988. We both joined her for this trip in Portland Vic to Adelaide South Australia. Our last trip aboard was the celebration of the Quincentenary of the USA where we joined The Eye in Puerto Rico and set sail for the Hudson River in New York for the 4th July (1992) and then to Boston. Quite an exciting trip. I had an unusual experience on my first trip in 1988 when we joined "The Eye" on the leg of the re-enactment of Australia's First Fleet in Portland in Victoria to Adelaide South Australia. As this was my first sail on this beautiful vessel I was quite excited and determined to have a wonderful time, so had my health and dental needs all checked out. I had not been to see a Dentist for 10 years so had quite a bit of work done before we sailed. On about the third day out, I had a terrible tooth ache, no amount of pain killers made any difference. I put up with this as long as I could. On our Watch a fellow crew member who came from Hamilton was a Dentist. So I asked if he could have a look and advise me what the do. He immediately diagnosed an abscess had formed under a front eye tooth and the only way was to extract the tooth. He arranged that after our early watch (4am to 8am) in the morning he would attend to it. We were well out to sea and no other ships of the fleet were in sight and it was too far out to put me ashore. Tiger put out an SOS for anyone in the Fleet asking if they had any dental equipment. He made contact with "Tucker Thompson" who had a pair of dental extractors and made plans to rendezvous with them and Tiger was to arrange to rig up a flying fox to collect the tool. Just on dawn the next morning we spotted the "Tucker Thompson" and as it was not far off our watch finishing, decided to wait a little while. Suddenly a big launch came up to see us, the name of this vessel was "Destiny". Fortunately Tiger spoke to the Master of the "Destiny" and arranged with him to sail over to "Tucker Thompson" to collect the dental tool and bring it to us. This done, watch over, I was taken into the saloon and lay down on the saloon table. The second mate sat on my feet, another crew member a nurse, held my hands, the first mate held a torch so as the Dentist could see clearly. He wore Glad Plastic Bags for gloves and as I opened my eyes and looked up saw all the rest of the Crew looking through the Skylight from the Upper Deck watching and photographing the whole episode. The time had come for the extraction WITHOUT ANY ANAESTHETIC. I can still feel the enormous tug as the Dentist twisted and pulled at the eye tooth, I'm sure it came from my boots! when WHAM out it came. Everyone clapped. The pain stopped immediately Everyone was marvellous, I shall always remember my first sail in "The Eye".